In my first years of leading worship, I had a person who would sing now and again for our church. It was back in the day when we used "special music". Every time this person would sing, I would take a deep breath and pray that this person wouldn't do anything weird. Most of the time, they would do ok, but every once in a while, this person would turn into a Branson act and really put on a show. The most notable thing this person would do is point at certain people in the congregation during the song. It was kind of like Tom Jones or some weird crooner. As a worship leader, I really had to learn to deal with that in a loving way, because it made me crazy on the inside. I just had to give it to God and eventually things got better. The reason it made me crazy was because I wanted our church to experience God's presence in amazing ways, and everytime this person would point at the crowd, it was bringing more attention to this person, instead of God. It was battling what I was doing, which was leading worship. As a worship leader, I'm really just pointing. The question is, to what or whom am I pointing? Leading the band and the church, I have an opportunity to point to myself. That's a real danger in my position, if I'm not careful. Being the center of attention in a worship service is like Kanye interrupting Taylor during her moment, or the congressman shouting out at the President during his address. It's taking the attention of everyone and pointing it directly to myself. That would be a worse case scenerio in a worship service. Worship leaders need to cultivate an environment so God-centered, that they become less and less important...not the center of attention. I could also point at the crowd. In worship leading, this is when I teach the church that it's all about them. This is where Galatians 1:10 has been so vital in my life. It says, "Am I now trying to win the approval of men, or of God? Or am I trying to please men? If I were still trying to please men, I would not be a servant of Christ." As a worship leader, if I give in to the desires and wants of the congregation, whether out of fear or the desire to please people, I am pointing at them and teaching them that what they want is more important than anything else. In some cases, I've had people vaguely argue that I should listen to them instead of the Holy Spirit. That's a ludicrous thought, but that's what happens to us when we get self-centered. It becomes all about ME. The only way to overcome all of this is to simply point to God. I have seen so much healing, transformation and restoration in church when people finally turn their eyes to Jesus. I am committing the ultimate heist when I point to anything or anyone, but God in our worship service. We cannot make God the center, because God already is the center. Colossians states very clearly that He holds it all together. As a worship leader, I've got to point to God, who is in the center and is the center. I will one day be gone from the worship leading stage. It could be years from now or tomorrow. If I am pointing to myself or anything else, other than God, I am pointing people towards things that will fade away. I'm pointing them towards eventual nothingness, when I could and should be pointing them to the everlasting God who does not fade, faint or grow weary. So, to what or whom am I pointing? That's a question that needs to be asked by all of us everyday of our lives. Gary, good point (sorry, I just couldn't resist)! No, really, this is good. 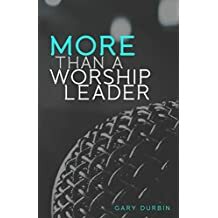 Our role as worship leaders is to be doing exactly that - leading others in seeing and acknowledging the worth of our incredible God, seeing Him as He is, and proclaiming what we see in ways that help open others' eyes to see Him too. Of course, if you really want to go Tom Jones with the pointing, you've got to wink and cluck your tongue at the same time. Something I've been trying to do everyday is be more transparent when leading worship, but maybe I can use the fact that people are naturally looking to me for direction to show them how to worship. Either way, thanks for this because I can never be reminded too many times! That's good also beyond the context of worship leading. It's just good leadership. Thanks for that mirror check!